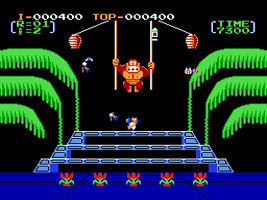 A home port of the classic arcade game Donkey Kong 3. Donkey Kong is causing mischief in Stanley's greenhouse, disturbing all the bugs. Stanley must protect his flowers and keep Donkey Kong at bay with his trusty can of bug spray. the NES port features a reduction in graphics quality and the removal of several enemies and stage types due to the hardware limitations.